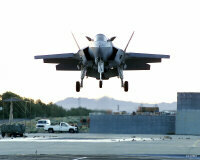 The F-35 will be the result from the Joint Strike Fighter program. The aim of the program is to develop an affordable next generation stealth strike aircraft for the US Air Force, US Navy, US Marine Corps and the United Kingdom as well as other US allies. The program enables various forms of participation for the candidate export countries, ranging from 'informed partner' to 'major participant'. Boeing and Lockheed Martin were the two competitors in the Concept Development Phase (CDP). The Boeing Corp. designed and built the X-32 prototype and the Lockheed Martin team developed the X-35. 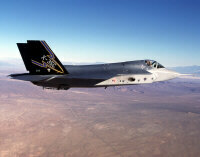 The X-35 concept by Lockheed Martin was selected as the winner and the program has now entered the Systems Development Demonstration (SDD) phase of the JSF program. The F-35A is the standard variant with conventional take off and landing developed for the US Air Force, the biggest JSF customer. The F-35A will replace the F-16 and the A-10 aircraft currently operated by the USAF. The F-35A will probably also be the most exported variant. Possible export countries for the F-35A include all current F-16 Fighting Falcon, F-4 Phantom, F/A-18 Hornet operators, such as the Netherlands, Belgium, Denmark, Norway, Turkey, Greece, Israel, Australia, etcetera. The F-35B is the STOVL variant of the JSF. The F-119 is modified using the experience of BAE Systems based on the Rolls-Royce Pegasus engine from the AV-8 Harrier. Unlike the Air Force variant the F-35B carries no internal gun and the air refuelling probe is located on the right side of the forward fuselage instead of receptacle on the top surface of the aircraft. The main customers for the F-35B will be the USMC to replace the F/A-18 Hornet ands the AV-8B Harrier IIs and the United Kingdom to replace the Royal Air Force/Royal Navy combined Harrier force of Sea Harriers and GR.7s. Other future customers can include Spain and Italy which also operate the Harrier. The F-35C is a modified design which enables the JSF to operate from aircraft carriers using conventional carrier landings and capapult take off. The F-35C internal structure and landing gear have been strengthened to handle the loads associated with catapult launches and arrested carrier landings. It has a larger wing area than other JSF types with larger control surfaces for better low speed handling. Like the F-35B is has a refuelling probe instead of a receptacle. The US Navy will be the biggest customer of this variant. The F-35C will complement the US Navy fleet of F/A-18E/F fighters by replacing the F/A-18 A+ and C Hornet currently in service. Future variants might include two seat trainers of each variant and possible modifications for export customers.